Chemists at the University of Waterloo have discovered the key reaction that takes place in sodium-air batteries that could pave the way for development of the so-called holy grail of electrochemical energy storage. WATERLOO — A Waterloo researcher discovered promising new molecules that targets cancer cells while sparing healthy cells. 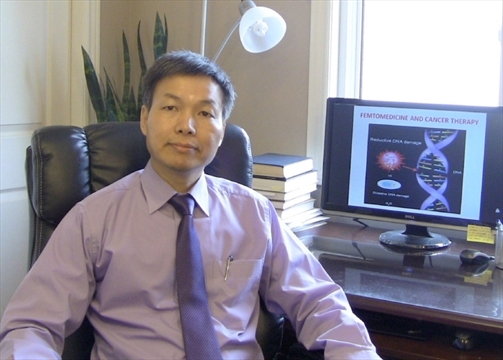 "It can kill the cancer cell and protect the normal cell," said Prof. Qing-Bin Lu, from the University of Waterloo's faculty of science. "We feel this is quite exciting." Not only are healthy cells protected, but the molecules identified by Lu and his Waterloo team are not toxic, avoiding the terrible side-effects of cancer drugs used today. Research underway at Canadian universities today will change the way we live tomorrow. Research2Reality, a new social media and television campaign by six of Canada’s top research institutions — including the University of Waterloo — aims to bring high-impact university research to the living rooms and laptops of millions of Canadians.